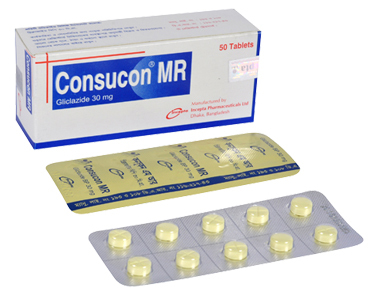 Consucon: Each tablet contains Gliclazide BP 80 mg.
Consucon MR: Each modified release tablet contains Gliclazide BP 30 mg.
Consucon (Gliclazide) is a second generation sulfonylurea drug that has hypoglycaemic and potentially useful haemobiological properties. It stimulates the release of insulin from pancreatic beta-cells by facilitating Ca+2 transport across the beta-cell membranes and decreases hepatic glucose output. Consucon and Consucon MR is indicated for the treatment of type 2 diabetes mellitus. Consucon: The usual initial dose is 40 to 80 mg daily. The dose can be increased upto 320 mg daily in divided doses when needed. The drug should be taken before meal. Consucon MR: The usual daily dosage is 1 to 4 tablets per day as a single dose. It is recommended that the drug should be taken at breakfast time. It is preferable to take this drug before breakfast in order to avoid or to minimize the possible onset of digestive disorders. There may be hypoglycaemia in concurrent conditions such as hepatic and renal disease, malnutrition, alcohol intoxication. Sometimes headache, gastrointestinal upsets, nausea, dizziness, skin reactions including rash, pruritus, erythema may occur. Gliclazide should be used carefully in patients with hepatic impairment. If there is definite hepatic disease then gliclazide should not be used. 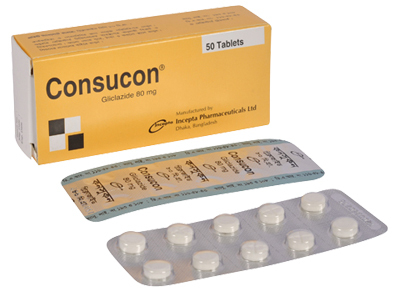 Consucon (Gliclazide) can be used safely in patients with renal insufficiency as it is extensively metabolized. Consucon has less sudden hypoglycaemic episode than other sulfonylurea group of drugs. Pregnant Women: Gliclazide should not be used in pregnant women although animal studies of Gliclazide have not shown any teratogenic effect. Nursing Mothers: This drug is contraindicated when breast feeding.